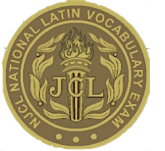 "Panel Eight: The Landmark Julius Caesar (LMJC): A New Resource for Latin Teachers and Students"
So, mark your calendar for ROME2020 in July of 2020! 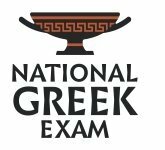 With the passing of Labor Day, Greek and Latin classrooms across the country are buzzing with authentic greetings and various review activities. Teachers are busy implementing new ideas and activities, sharing their ideas online, and reaching out to one another especially online for suggestions and advice. 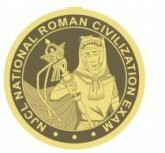 Check out social media resources such as these Facebook groups: AP Latin Teachers, LNM Idea Exchange, IB Latin Teacher Idea Exchange, and Latin Teacher Idea Exchange. The Facebook group Latin Best Practices: The Next Generation in Comprehensible Input is also a great resource especially for active Latin and comprehensible instruction ideas. Another way of sharing ideas and suggestions with colleagues is to become involved in your state classics organization, the regional organization, and a national organization like the American Classical League. Their annual institute takes place in New York City next summer as part of their centennial celebrations. In addition, ACL is sponsoring regional gatherings and celebrations over the course of the year. 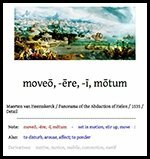 Many a Latin teacher does not have a classics colleague at their school and is often frustrated that their modern language colleagues don't understand the dynamics of the classics classroom. Attending the regular gatherings of these professional groups provides the opportunity not only to attend presentations on pedagogy and scholarship but also and more importantly to interact over break, at meals, and in the evenings after the formal sessions. I still remember connecting with colleagues at my first meeting of the Illinois Classical Conference in 1978 on a wintry day at the Orrington Hotel in Evanston, IL. Throughout my years teaching high school Latin, I made sure to attend ICC's annual meeting and regularly consulted my Latin teacher colleagues who soon became and remain good friends. Since joining Bolchazy-Carducci Publishers, I am privileged to represent the company at conferences and institutes throughout the country. What I first experienced in 1978 comes to mind each time I attend a conference. Interacting with you teachers is one of the great benefits of this job. Bolchazy-Carducci Publishers takes pride in exhibiting its inventory of Latin and Greek titles at conferences throughout the year. Check out our calendar of conferences. 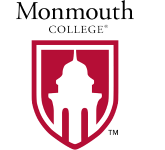 This year, we're pleased to add Monmouth's Classic Day Festival and to return to both the Classical Association of the Empire State and the Tennessee Classical Association meetings. We agree with so many teachers who have shared "there's no substitute for taking a book in your hands and checking it out." Come see us! Ut semper . . . all of us at Bolchazy-Carducci Publishers wish you and your students a wonderful learning adventure! This summer, I reacquainted myself with Padlet, a web-based tool for creating virtual bulletin boards. Think of it as a digital version of your classroom bulletin board. The virtual bulletin board can contain text, links, and images. You can use it as a way to showcase the work of an entire class, as a collection of resources on a particular topic, or even as a brainstorming session. A few years ago, in my AP Latin class, I created individual boards for the themes of the AP course. As students encountered passages of Latin related to the different themes, they added a note to the Padlet board referencing the Latin text and explaining its relationship to the theme. Periodically, I allocated a few minutes of class time for students to add to the Padlet boards. I appreciated how easy it was for the students to add their thoughts to the board and especially loved what a great resource it was during review time. After her many years teaching Latin, chairing the language department, and serving as an instructional specialist, Lynne has moved to Valencia where she has launched Sunodia Educational Consulting. Lynne will continue to pen eLitterae's "Tech Tip." We all wish Lynne well in her new professional venture. Intrigued by the name "sunodia"? We've included it in "Classics Tidbits." Kudos to B-C editor Laurel Draper, who completed her first half-marathon at the Millennium Meadows race in Grand Rapids, MI, on August 26! Tradition has it that in 490 BCE, Pheidippides (or Philippides) ran about 150 miles in two days to request the aid of the Spartans against the Persians in the battle of Marathon. Following the battle, he then ran about 25 miles to Athens to report the Athenian victory and died after delivering his message. The marathon race, a tribute to Pheidippides's last run, was one of the events in the first modern Olympics held in 1896. In 1982, five members of the Royal Air Force sought to recreate Pheidippides's 150-mile run. Three runners succeeded in completing the course in a day and a half, and the 153-mile Spartathlon has been held in Greece since 1983. 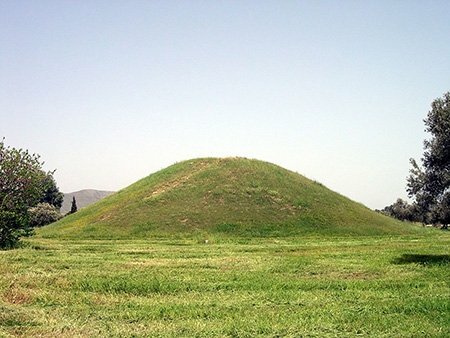 Two tumuli commemorate those who fell in the Battle of Marathon in 490 BCE—the one pictured dominates the landscape and contains the ashes of 192 Athenians and the other contains the inhumed bodies of the Plataeans who fell in the battle. Creative Commons 3.0. 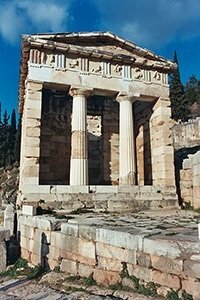 The Treasury of the Athenians was erected at Delphi to house the spoils of the Athenian victory over the Persians at Marathon. Creative Commons 3.0. A Tribute to Lou Bolchazy, PhD. For Bolchazy-Carducci folks, Enkidu and Gilgamesh readily bring our beloved late founder Lou Bolchazy, PhD., to mind. 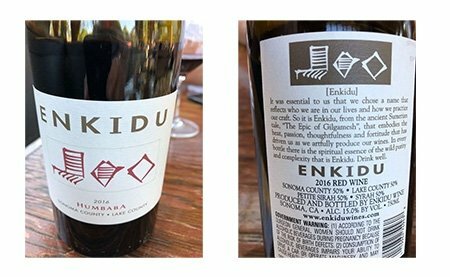 Allan Bolchazy, Lou's son and until recently B-C's vice president, shared these images from a visit to the Enkidu Winery in Sonoma, CA. As Marie (chair of the Bolchazy-Carducci Publishers board and former president), Lou's wife, is fond of reminding us, The Epic of Gilgamesh held a special place in Lou's mind and in his heart. He was so very proud of the Gilgamesh titles he published and loved presenting about the pre-Homeric epic. So, it's no surprise that Allan took photos and sent them along. While the label explains the winery's name, do check out the website for a more extensive explanation. Note that the Enkidu Winery's Red Rhone blend is named "Humbaba" since "it embodies the monster of the Cedar Forest himself." The blend contains some syrah, the grapes for which the company grows in its Odyssey vineyard. Carmen 13 is Catullus's parody of an invitation. It serves as an ideal supplement for the Latin III or Latin IV class! This selection is taken from B-C's Lectiones Memorabiles Volume III: Selections from Caesar, Catullus, Horace, Livy, Ovid, and Vergil. The Latin readings in the volume, authored by Marianthe Colakis and Yasuko Taoka, explore Vergil, history, and love poetry. Editor's Note: The PDF from Lectiones Memorabiles Volume III is provided for classroom use only as downloaded by the eLitterae subscriber and is not to be otherwise copied or distributed. The beautiful ancient city of Palmyra may reopen next year. A discussion about protecting antiquities in war zones. Discovery of coins leads to an early Roman settlement in Yorkshire. Check out the Guardian and Smithsonian. Get the socio-economic scoop on ancient Roman poop and parasites. Is the Minotaur's labyrinthine lair a lie? Homer's Odyssey was not fake news! An ideal energy boost for the Latin teacher. Grave reveals Greek ceramicists were not all male. A new look at the Trojan War. Enter coupon code eLit0918 on the payment page. The special offer pricing will be charged at checkout. 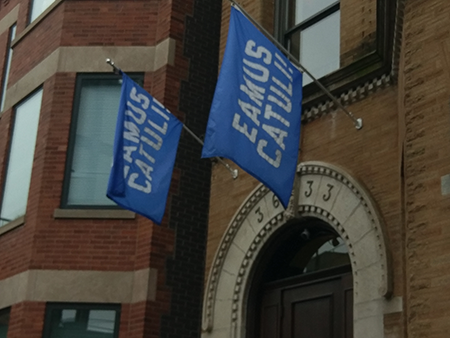 A recent trip to Wrigley Field for a Cubs game sparked sharing this well-meaning Latin. 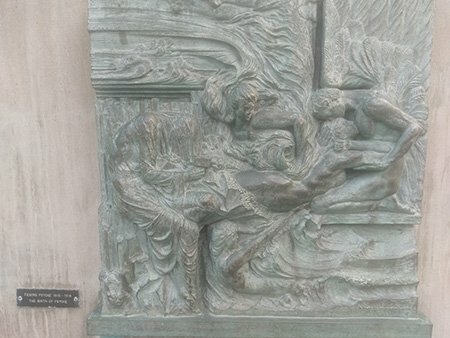 The Birth of Psyche in the sculpture garden at the Einar Jónsson Museum in Reykjavík, Iceland. 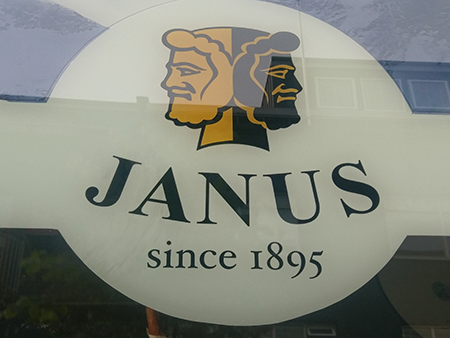 Janus, a Norwegian firm, has been producing clothing made from soft merino wool or merino wool blends for children and adults since 1895. The logo graces the front window (hence, the reflection) of the Ullarkistan shop in Reykjavík, Iceland. "Tech Tip" author Lynne West notes, "Συνοδία (sunodia) is an ancient Greek word that describes a journey that one takes with companions." What a great name for an educational consultant company or for teaching itself! Coauthor of Bolchazy-Carducci Publishers' anthology A Roman Women Reader: Selections from the 2nd Century BCE–2nd Century CE (Bolchazy-Carducci Publishers, 2015), Professor Hallett is renowned for her study of gender and sexuality. 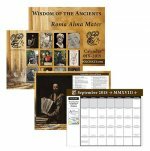 In her webinar, she will provide a guided reading and insights on Roman women. Judith P. Hallett is professor emerita of classics at the University of Maryland at College Park. Hallett received her BA from Wellesley College and her MA and PhD from Harvard University. Professor Joseph will share his recent research on the classical influence on the United States. His webinar will focus on a few figures in US history who have drawn on classical models of "troublemakers" or gadflies. The webinar will present Socrates as a model for Martin Luther King, Jr. and how John Quincy Adams, in his abolitionist writings, drew on the Roman Cato and, in a different way, on the Carthaginian Hannibal. Timothy Joseph graduated from the College of the Holy Cross with a BA in Classics and then taught Latin at Cresskill Junior-Senior High School in New Jersey from 1998 to 2001. He went on to earn a PhD in Classical Philology from Harvard University in 2007. He joined the classics department at Holy Cross in 2006. He has served as department chair and as director of the Classical Association of New England's Summer Institute at Brown University. Debra L. Nousek is associate professor at The University of Western Ontario in Canada where she served as Director of the Graduate Program in the Classics. She earned a BA at the University of Alberta, an MA at the University of California at Santa Barbara, and a PhD from Rutgers University. Recognized internationally for his expertise and scholarship in medieval and Neo-Latin, Professor Tunberg will share his passion for post-antique Latin in this webinar. Tunberg will discuss representative examples of this beautiful bounty—twice as much Latin published in the post-antique period as during the Roman era—noting that many authors emulated the style of their Roman predecessors. Terence Owen Tunberg is a professor in the Department of Classical Languages and teaches in the Honors Program at the University of Kentucky. Tunberg received a BA and MA in classics from the University of Southern California and a PhD from the University of Toronto. Visit our website for complete author bios.